As a nonprofit, what are all of the ways that your work produces financial returns, directly and indirectly? And who benefits financially from what you do–your beneficiaries? Other nonprofits, businesses, taxpayers or the government? Every day DC Central Kitchen (DCCK) collects 3,000 pounds of surplus food from restaurants and local farms and converts it into 4,500 meals that are distributed to 100 shelters, transitional homes, and rehabilitation clinics in Washington, D.C. 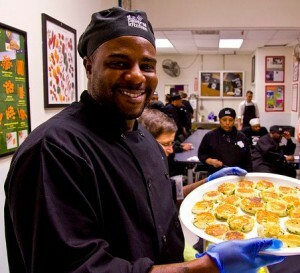 It runs a culinary job training program that trains and helps employ 90 people a year. These 90 students (recovering addicts, the recently homeless or previously incarcerated) graduate to earn $2 million, collectively, per year. DCCK also runs a catering company that generates revenue and provides transitional employment for recent culinary training program graduates. It would be easy to focus only on earned-income strategies–and that’s a crucial piece to helping nonprofits lessen their dependency on individual and institutional donors–but even an earned-income approach sells a nonprofit short of its total financial impact. Instead, widen the lens to think about your organization’s financial influence. What groups are benefitting, directly or indirectly? The dazzling part comes when you begin to make connections between your work’s beneficiaries, participants and partners so that one activity benefits three others. Robert Egger founded DC Central Kitchen in 1988. I spent this morning preparing some of the 4,500 dinners served tonight. Afterward, I had the chance to talk with Robert about the power (in impact and size) of the nonprofit sector. Our conversation pushed me to widen my view of nonprofit profitability. I love this post and this concept, Olivia! One of the things that always makes me nervous about advocating non-traditional revenue sources for NPOs, however, is my own ignorance about legal and tax implications of doing so. Do you have any insight as to whether this type of income would be taxed differently for an NPO? Excellent question, which I share. The couple of times I’ve waded into the legal details (for nonprofits as well as L3C) have made me value the input of a lawyer and CPA. My advice is for companies and nonprofits to run their programs by the pros who are familiar with state tax laws. I’m happy to make recommendations on counsel that specialize in for-benefit organizations. Olivia is exactly right in recommending that you are working with professionals who know the laws or at least the precedents. One of the biggest problems with operating in this social enterprise realm is that the IRS goes out of its way not to draw a clear and distinct line between activities that are permissible and those that aren’t. We should be clear that as a nonprofit we pay a whole host of taxes, payroll tax, FICA, SUTA, FUTA and sales tax. The only tax that we do not pay is income tax and any profits we would make. These profits, however, are invested directly back into our programs. One of the very unfortunate terms that comes up when we look at our social enterprise programs is “charitable class,” ie, the “class” of people our nonprofit was established to empower. Because all of our employees in these revenue generating businesses are graduates of our Culinary Job Training Program, they fit in our “charitable class.” In addition, any profit generated by these activities are used to support the other programs of DC Central Kitchen, also benefiting our “charitable class.” Finally, we are right in line with our mission: “Using food as a tool to strengthen bodies, empower minds and build communities.” So if we hired people from outside our program and paid them minimum wage to silk screen t-shirts, we would be running outside the spirit of our 501(c)3 designation. Mike, thanks so much for helping to illuminate some of this! Complex indeed from a legal/tax perspective. I know that Robert Egger is advocating for legal reform, which would clear up some of these issues. Love what you’re doing, Olivia, and love the DCCK story. We’re exploring the idea of developing social ventures as well, and we’re bumping up against some very strongly held cultural beliefs that philanthropy and commercial outcomes don’t mix. In other words, if a venture tries to show some kind of financial return, it alienates those who have supported it for altruistic reasons. Are you finding anything similar? Thanks, Michael. Yes, I’ve definitely come across that and bet that Robert Eggers has as well. I feel (as I’m sure you do) that that argument is so short sighted. Are we about making change or supporting egos? Perhaps I’m being to rash (not knowing the details) but I think the more we collaborate between sectors, models, etc. and shake off old expectations, the greater and more far-reaching our change can be. Opus Two looks interesting…I’m happy to speak with you any time. This is a HUGE issue…this false divide that, to our economic detriment, we continue to honor. Think about it–we are raising an entire generation performing community service…and then, on graduation day we say…literally…”now you must decide–you can either do good, or make money…you must be either a .com or a .org”. This is “my” generation’s construct. This is just a tax code. This is just a policy. It can, and must, be challenged, changed or busted so that we incentivize, and REWARD, investment in community. Why not create a ROI for nonprofits, so that a “donation” to DCCK yields an annual, and increasing tax deduction for donors, based on our ability to measure and verify that (in our case) fewer men and women went back to jail (costing us dough) but who are now getting paid (which sents out economic ripples via rent. food, gas, clothing purchases) and paying taxes??!!? Imagine how that would revolutionize philanthropy. I do. Go for it. All it takes is electing people who dig / get / want / go after social enterprise, micro-credit and 21st century philanthropy…versus 20th century charity. LOVE the ROI for nonprofits! Yes, yes! Let’s talk more about how I can help you with this practice and shift. I’ll try to borrow this concept for developing social venture in Korea, with a ngo helping teenagers. That sounds like an excellent endeavor. It’s hard for me to lend advice without knowing more. I’m happy to try to answer any specific questions you have. This has been an amazing article to read, I am 17 and was inspired by my best friend’s parent’s idea for a farmer’s market that hires teens to teach them business skills and trains them along with providing a real salary. It combines business with non-profit. Although it was a good cause and a smart combination, my idea differs completely in that I want to start something to help the homeless in my community, I am still brainstorming as to how to make this somehow profitable just for the sake of keeping the organization afloat…THIS HAS GIVEN ME HOPE, THANK YOU! That’s a killer vision. You can see from this post on DC Central Kitchen that founder Robert Eggers found a way to tie this work (and service) to a real need. That’s what allowed him to develop a business through DC Central Kitchen. He still fundraised for the organization but having this defined source of revenue helped with his overall operations and allowed him to employee more people.